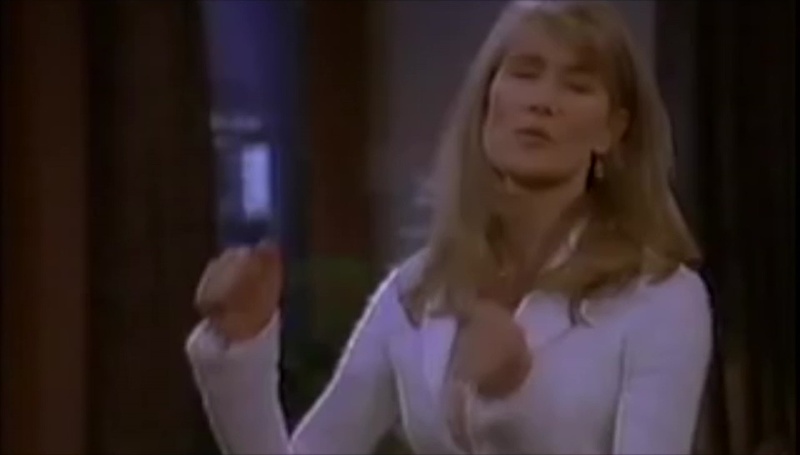 In the second half of the episode, Ellen is hanging out with Susan (played by Lara Dern) who, after hearing of Ellen’s disastrous ‘date’ with a male friend, admits that she thought Ellen was gay. Ellen, still claiming to be heterosexual at this time, says she’s not and becomes very flustered. She then accuses Susan of trying to ‘recruit’ her. Susan sarcastically complains she’ll have to tell National Headquarters that Ellen got away, and darn it, one more lesbian and she’d have been that toaster oven. At the end of the episode, Susan brings Ellen to a coffee house where Melissa Etheridge ask her one question, “Are you gay?” When Ellen says she is, a very enthusiastic Etheridge has her sign papers and stamps pretty much everything, before handing Susan … a toaster oven. For a period of time in the 90s and early 2000s, it wasn’t uncommon to hear people joke “One more and I get that toaster!” Naturally people elevated that to things like “Forget the toaster, I’m going for the Ferrari!” It was just one of those things we joked about. Some people wore shirts and carried signs to parades, others just giggled when someone asked about buying a toaster. Over time, the idea of a toaster oven faded into just a toaster. They’re not the same thing, of course, but toaster, toaster oven, and so on. It makes sense, right? It’s a regular toaster with two slices of bread popping out, colored in the gay pride stripes. Originally we attempted to use a toaster oven, but it looked too much like a television. While that makes sense for this site, it also would be a little confusing. There also was an idea of putting antennae atop it, but that looked weird. The point of the toaster is a simple hat-tip to Ellen and the history of one more and maybe we’ll get that toaster.